The India-Russia partnership in civil nuclear energy is underpinned by trust and reliability. Now, atomic cooperation between the two strategic partners has acquired a new upswing and solidity with two Indian states offering sites for building Russia-aided atomic reactors. The India-Russia nuclear cooperation has received a boost with two of the Indian states – Andhra Pradesh and Karnataka – coming forward to offer sites for the establishment of nuclear reactors. This development will add substance to the deals signed during President Vladimir Putin’s visit to India last December. During the visit, Putin had proposed to build at least 12 nuclear reactors in India, a country which is growing fast with high energy demands, but without much indigenous resources. Among various types of energy, nuclear power is considered clean and relatively safe. Except few mishaps like the Fukushima radiation disaster, nuclear energy is considered a safe source of energy in many developed countries. As per a report, in the nuclear reactors in Kudankulam, safety measures have been taken to avoid the Fukushima-type disasters, or other natural havocs like earthquakes. Except the initial heavy costs, the nuclear energy is also cheaper in comparison to some other sources. As per a report, the cost of one kilowatt-hour of electricity from Kudankulam will be about Rs 3.5. The saga of the India-Russia energy cooperation, including nuclear energy cooperation, is long. Russia is a significant contributor to India’s energy mix, and the potential of cooperation is indeed huge. The negotiation for the building of reactors had started during the Soviet era in 1988. The Soviet collapse brought a pause to the negotiations, and the initial fragility in the post-cold war relations contributed to the slow pace. The Nuclear Suppliers Group pact in 1992 had complicated the scenario. But the relations revived soon. Russian Minister of Atomic Energy signed a deal in New Delhi in 1998 to build two nuclear reactors at Kudankulam. Russia’s foreign minister, during a meeting with his Indian counterpart in Moscow in 2005, even said that the NSG could make an exception regarding India and relax the norms so that civilian nuclear energy cooperation could take concrete shape. It may be difficult for India to have such kinds of assurances from other countries. 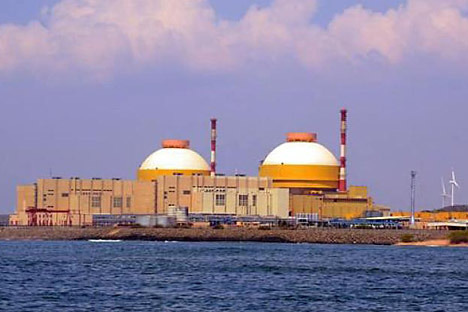 With the operationalisation of Kudankulam 1 in 2014, the India-Russia nuclear cooperation has acquired a new solidity. The nuclear reactor has added 20 per cent to the existing nuclear generation of electricity in India. The second unit of the power plant will likely be operational soon. There are plans to establish two more units in the plant. During his Delhi visit last year, President Putin had expressed satisfaction at the level of nuclear cooperation. He had said, “We have reached a new level of cooperation. This is not just about trade and services, but this is the creation of the new industrial branch”. India’s relations with Russia are sometimes taken for granted as they lack the hype associated with the relations with some other countries. It needs, however, to be underlined that the India-Russia partnership is steady – the cooperation in nuclear energy is a clear example in this regard. For the establishment of the new nuclear reactor, the initial choice was Haripur in West Bengal. As a nuclear reactor requires a lot of water as coolant, it is preferable to have it established where water resources are abundant. The resistance from some local groups, and lack of support from the populist state government, shelved the plan. As India has a multi-party federal system with powers distributed between the states and the union, it becomes difficult to take a decision. The Indian government had also looked for options in other coastal provinces like Odisha and Kerala, but these states appeared reluctant. With Andhra Pradesh and Karnataka, also coastal states, coming forward, the issue of site for the nuclear reactors has been solved for now. Karnataka’s energy minister described the offer of the site to establish the nuclear plant ‘in the larger interest of the state’. He also termed it as an “opportunity.” Besides generating energy, the reactors will also provide employment to the local people. Kundankulam nuclear plant will supply electricity to Tamil Nadu, Kerala, Andhra Pradesh, Karnataka, and Union Territory of Puducherry. A large number of the Indian people do not have electricity in their houses. The establishment of nuclear reactors will not only meet the energy requirements of the Indian hinterlands, but also supply energy to its booming sectors of industry. It is likely that by the next year, the work on establishing new nuclear plants will start. By the year 2035 there will likely be 12 more nuclear reactors in India with the Russian support. In India’s nuclear odyssey, Russia has been a steady partner throughout. It has supported India’s peaceful exploration of nuclear energy. To give one example of this reliability, when the Tarapore nuclear plant was short of fuel in 2006, Russia promptly came forward to supply fuel. It may sound anachronistic to talk about nuclear weapons in the age of globalisation and cooperative diplomacy, but talks about nuclear energy and its exploration is not passé. India and Russia have much to gain from mutual cooperation in this sector. The cooperation may also synergise Indian Prime Minister’s Make in India initiative.